Christian Chukwuka, an evangelist and founder of Abounding Grace Foundation, has called on the federal government to ensure that babies are not made to suffer for the sins of their parents by serving time in prison with them. 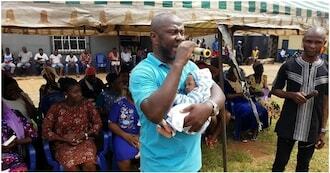 Photos shared by the evangelist on Facebook have received heartbreaking reactions after the evangelist revealed that he had come across a one-month-old baby serving time with his mother when he visited prison. The man of God had visited a prison to share motivation and rehabilitate the inmates. It was gathered that the one-month-old baby's name is Onyedika. On his post, he allege that over fifty babies are being treated the same way. He wrote: "One Month old baby boy thrown into jail with her mother…. Are babies supposed to serve prison sentence with their mother or be kept in motherless babies’ home or with their relatives outside until mother is released? PLEASE SEND ME YOUR SUGGESTION SO ABOUNDING GRACE MAY START THE PROCESS OF LIBERATING INNOCENT BABIES FROM THEIR MOTHER’S ERROR OR PUNISHMENT ON. OVER FIFTY BABIES ARE UNDER SILENT PAIN WITH THEIR MOTHERS IN PRISON. JOIN ME TO HELP THEM PLEASE!" The evangelist further revealed that his church was able to give some pregnant prisoners at the prison some help. He also noted that the women did not get pregnant inside the prison. He added that they had been sentenced with buns in their oven. "AGF did not leave the pregnant prisoners unhelped. We also have so many pregnant women in Nigerian prisons. Dont get it twisted, they did not get the pregnancy from the prison yard but from outside before coming into the prison. Just that they need help in order to sustain the pregnancy and deliver safely. Join me in helping them. "